Your resume has only seconds to impress Prospective Employers. Senior Management to Director-Level Resume Writing for experienced professionals in any industry or sector. 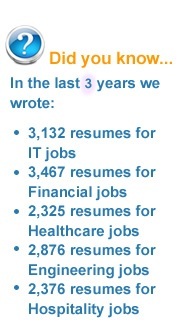 Get your resume noticed by employers, job search consultants and recruiters. We are committed to delivering excellence in resume writing enabling you to take your career to the next level. Win more interviews and secure your next position. Call 1.877.212.54441.877.212.5444 or email us for a free resume critique. As well, all resumes are search engine optimized with job-specific keywords, resume phrases and industry terminologies for hiring systems and resume screening software so you can generate multiple interviews leading to your next offer of employment faster. Office Hours. Speak with our writers in “real time” during office hours (9:00am to 5:00pm Monday to Friday) toll-free in North America. A deposit of 50% is required to start working on your resume. Same day Service (24 hours) can be arranged for an additional fee. Call us at 1.877.212.54441.877.212.5444 or email for more details. Please note that a price quote will be provided once we have reviewed the work to be completed. If there is a price difference, the resume consultant will inform you upon the conclusion of the resume consultation process for your approval and go ahead. The resume consultation is free. Please read more on our payment methods and terms. HST is applicable on all Career Services purchased by Canadian customers.